Play your cards right and you just might escape the zombie apocalypse! 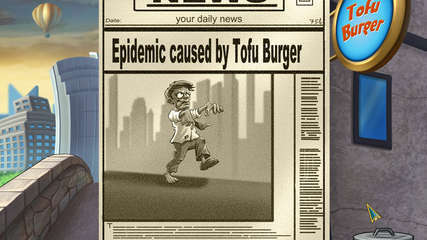 It’s been two weeks since an infected tofu burger transformed some poor soul from a gentle vegetarian into a brain-devouring zombie. One thing led to another and now the slobbering undead have taken over the city. There’s only thing to do – run for your life! Before your can get your sweet behind to salvation on a zombie-free island, you’ll need to puzzle your way though exciting rounds of solitaire and fun minigames. But watch out! The hungry zombie horde is hot on your heels! Biting humor and fun card-game action await you in Zombie Solitaire. You’ll have to use your brain if you want to keep it!